Aphelele Mtwecu is a member of the Heavy Chef community in Khayelitsha. After watching Masechaba Ndlovu’s seminal talk in Khayelitsha in September 2018, she wrote this moving piece. 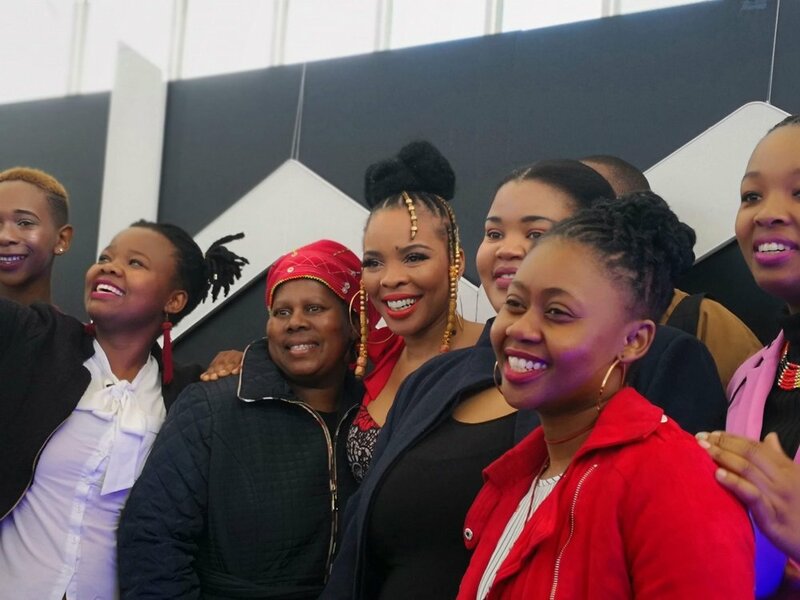 An intriguing event filled with laughter and tears, Masechaba started us off with her journey of moving from one country to another. This would later very much shape the person she is today. Something people don’t know much about Maechaba is that she is a child of political activists that were exiled during apartheid and she was raised by a community of activists who at some point smuggled her into the country. The radio personality tells us that strangely enough she had not always been as outspoken as she is today, in her own words she said ‘’I was a victim of bullying because I was so shy’’. There are many aspects of Masechaba’s life that we can learn from however what stood out for me was how she told us that she was a writer and her poems were published at a very young age and she continues writing as of today. She mentioned the importance of always empowering one through reading and learning and looking at all methods to develop one’s skills. Second to this is how she has always sought unconventional ways to attain what she wants and told us how we should never take no for an answer - something I deem as a lesson that many young people in our quest to uplift our careers could benefit from. Central to these experiences of attempting all methods to attain your goals is how you should always negotiate from a position of power and adopt what is notoriously known as an ‘’impostor syndrome’’ -that is, basically faking it till you make it. She finally tapped into how people should no let failure be the reason to stop then from fulfilling their dreams and that every milestone is part of our journey and it is very purposeful. Heavy Chef brings a very important aspect of youth development in the townships and this initiative ignites a new hope for entrepreneurs. Masechaba - like DJ Sbu - showed us that contrary to popular belief about millennials being a ‘’reckless group’’, have endeavors of changing their future through learning from other people’s experiences. Young people showing up in vast numbers to network, share and learn reveals the urge for young people to grow their crafts and businesses, and Heavy Chef opens up an opportunity for more high impact people to influence these young people. Although I know that Heavy Chef is both profit and development driven, I observed that the readiness levels of entrepreneurs in Khayelitsha making use of these opportunities given to them through this platform is dwindling. The engagement with Masechaba had more to do with sentimental value than ‘’how can I improve my business or build my personal brand’’ and I hope that Heavy Chef can find way to close this gap to help people seize opportunity and ask the right questions. The reality is that most entrepreneurial incubator programs are run for minimal or low impact purposes and this does not give start-up entrepreneurs enough skills to sustain their businesses post these programs. The question remains how can Heavy Chef can assist in closing this gap, without necessarily starting another incubator program. Finally, although Heavy Chef has hosted many great speakers,we hope that as time progresses Khayelitsha and surrounding townships can also move out of the celebrity leg of success and actually find people that are in other industries that do important and successful work. I acknowledge the fact that networking and inspirational speeches are important however content is the most fundamental part of building a business. Aphelele Mtwecu, 26 years, is an Educator, Social Activist, Curriculum developer, Writer, Social innovator, and, according to her own words, “a mixed breed of introvert & extrovert. “My passion for social justice derives from the daily encounters many black people experience in our communities as a result of past injustices, the need for a new society and what that society would look like is what drives me. I graduated with a B.Soc.Sc (Human and Societal Dynamics) majoring in Sociology. I served in various student and worker formations, among them being National Deputy President of PASMA (2015-16) in spearheading the call of #FeesMustFall and #OutsourcingMustFall. In 2017-2018 I stepped into grassroots activism through the Tshisimani Centre For Activist Education as a Junior Fellow.